Union Station, also known as Albany Union Station, is a building in downtown Albany, New York. Built during 1899–1900, it originally served as the city's railroad station but now houses bank offices. It was listed on the National Register of Historic Places (NRHP) in 1971. 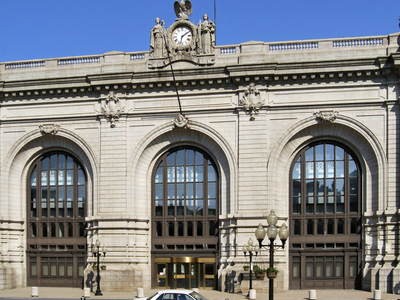 Perhaps no other building has been so important to the growth of Albany during the twentieth century as Union Station. It was designed in 1899 by Shepley, Rutan and Coolidge, the successors to the firm of H.H. Richardson and the designers of the newly completed South Station in Boston and Union Station in Springfield, Massachusetts. The construction was carried out by Norcross Brothers, who were considered to be one of the finest contractors of the period. The station received 96 trains per day in 1900 and 121 per day during World War II. It was the Capital District's main railroad station until December 1968. Built primarily to serve the New York Central's passenger trains, it also hosted the services of the Delaware & Hudson. In 1968 the Albany-Rensselaer Rail Station opened across the river in Rensselaer. Here's the our members favorite photos of "Key Buildings in Albany". Upload your photo of Union Station!